KT Pe Benito. "Entries to Faustina (Growing Out of Colonialism for My Grandmother’s Sake)." 2018. Courtesy of the Queens Museum. Photo by Hai Zhang. Two 2016 School of Art alumni explore decolonization and placemaking at Queens International 2018, a contemporary art biennial that runs through February 24th at the Queens Museum and select Queens Library branches. “Volumes,” this year’s theme, brings together 43 Queens-connected artists to explore concepts of collecting, accumulating, and distributing information, with many works highlighting the artists’ own connections to local and global communities. This year Emilio Martinez Poppe and KT Pe Benito have works featured in the show. They will be giving a tour of their work on the closing day, February 24. 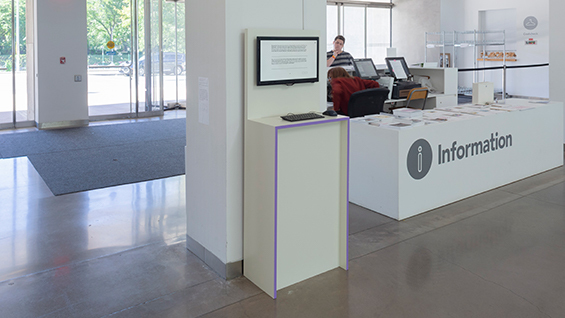 Martinez Poppe’s installation, “End Credits for the Places That Make Us,” uses computer kiosks located throughout the Queens Museum, prompting visitors to respond to questions about placemaking and memory. 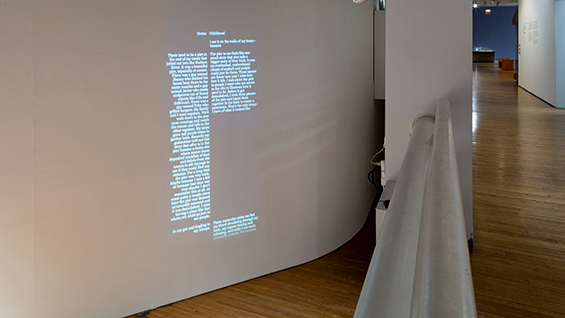 As museumgoers exchange dialogue with the computers, a database of participant responses is projected on the gallery walls as an endlessly scrolling list, styled like the credits to a film. 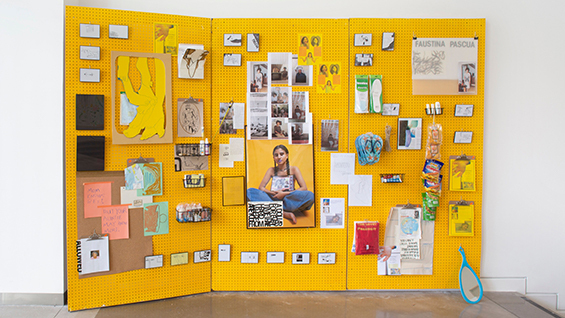 When you enter the museum you will be greeted by KT Pe Benito’s work: a tall, yellow, three-panel pegboard filled with photographs, memorabilia, texts, collage, drawings, and a letter written to the artist’s late grandmother. Entitled "Entries to Faustina (Growing Out of Colonialism for My Grandmother’s Sake)," the work pieces together family history and research into what the artist refers to as the “Filipinx” diaspora. “I was interested in bringing in a local and personal narrative: an organization of my life, family lineage, and where I come from,” explains Pe Benito, who first started working with the pegboard as a student artist. “When I was making this work at Cooper, I was addressing my nuclear heteronormative interracial family structure. In this iteration at Queens Museum, I prioritize the relationship I hold with my Filipinx non-binary identity and with my late grandmother, Faustina Pascua.” Pe Benito describes the work as an altar to their grandmother’s migration from the Philippines to California. Queens International 2018 is the first museum showing for the two alumni. The biennial, appropriately situated on the former 1964 World’s Fair ground, was launched in 2002 to showcase the cultural and artistic output of the borough as a hub of diversity, where more than 165 languages and dialects are spoken daily. Noticeable differences between the skyline of the panorama and the New York City of today point to another central theme of Martinez Poppe’s practice. The artist’s work with Fourth Arts Block, a community arts organization that supports anti-displacement organizing in the Lower East Side, has brought into focus the effects of change in built environments on the cultural fabric of urban communities. The organization has recently partnered with United for Small Business NYC, a campaign to protect small businesses that often serve low-income neighborhoods or are owned by migrants and people of color. “Small businesses play an especially important role for marginalized communities as we face adversity in gathering in public or feel that our culture has institutions which can represent it beyond our lifetimes,” says Martinez Poppe. On Sunday, February 24th, KT Pe Benito and Emilio Martinez Poppe will lead a tour of Queens International 2018: Volumes at the Queens Museum with Assistant Curator Sophia Marisa Lucas. You can register here.